Welcome to 2018! Now that the holidays are over and it’s back to work, you will need to make sure that your home is ready for the New Year. A good clean-up and home declutter might be in order to prepare for the 12 months ahead. Where cleaning is concerned, Apple Clean is at your service. We have 25+ years’ experience and provide a friendly, local service that is second to none. For more information or to book, please contact us on 0800 587 4571. Fresh smelling and perfect looking carpets create a welcoming ambience in your home, so why not treat them to a post-Christmas clean? At Apple Clean, we can promise you a safe, gentle and effective cleaning process using the very latest equipment to leave your carpets spotlessly clean and dry to walk on within hours. In the kitchen, your worktops will have been in constant use over the holidays, so make sure everything is hygienically clean now that the festivities are over. Uncooked meats and other food debris can leave germs and bacteria behind but a quick wipe over after every food preparation should do the trick. Don’t forget shelves, tables, chairs and upholstered furniture to remove any stains, dirt or dust build-up. Your oven will have been working overtime over the festive period, with all that cooking and baking! Now it’s time to give your oven some much needed TLC. So that you can have a rest too, why not hire a professional oven cleaner to give your kitchen appliance a thorough going over? Knowing that your oven is ready for whatever you may decide to throw at it (not literally, obviously! ), will allow you to focus on the year ahead, safe in the knowledge that last year’s grime and grease has been dealt with. Your Christmas decorations have done their duty – now it’s time for them to be put away safely for another year. But before you do so, take a long look at each item and decide whether it needs attention. Whether your glass baubles need careful cleaning, old family heirloom decorations need repairing or the fairy light need replacing, you want to be confident that your Christmas decorations will be fit for purpose in another 11 months’ time. 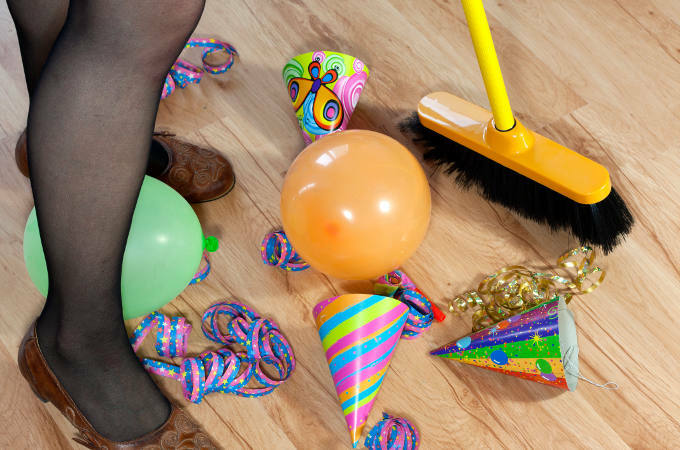 Finally, January is the traditional time to have a clear-out, so you can face the New Year with confidence and without clutter. You know what they say: Out with the old, in with the new. For each item, ask yourself: Have I used this within the last 12 months? If not, consider selling it, giving it to charity or throwing it away. You’ll be surprised how liberating a good old clear out can be for both body and soul.